This morning, we showed up to church a bit early. Our little group has matured as a whole while we’ve been away; most weeks there’s somebody scheduled to run Sabbath School and another to preach. Last week, Sarah gave her first sermon in French (I’m so proud of her, she’s gone from zero to preaching in French in 2 years!). I didn’t know who was scheduled to preach this week, but I figured it was scheduled. Arriving at church, I asked who was scheduled to preach to our friend Aaron, he replied that he didn’t know. As Sabbath School was about to start, he turned to me and asked if I would preach. “Sure,” I said, still used to the almost weekly routine of the past, where the sermon-ator wouldn’t show up or wasn’t prepared, and I had to throw something together on the fly. At least today I could prepare during Sabbath School. Unlike normal, I stepped out of church and went around back. “Lord,” I prayed, “Please guide me to the message that needs to be heard.” My thoughts wandered a bit: maybe I could share the conversation I had with our crippled friend Emmanuel about the joys of living life eternally free from the problems in this life, in perfect health forever. But that was for that time and situation. I kept browsing the Bible, then finally, I fixed on a subject. Ready for the semi-improvised sermon, I came back into the church as they were finishing up the class. When the time came, I stood up and started talking about Nicodemus and Jesus’s conversation at night, how Jesus said we had to be born again in Spirit, and I explained how a baby can’t walk, talk, or control their faculties, yet they’re still humans, just as new Christians can still make big messes consistently, but that doesn’t make them less Christian. If they’re not growing, though, that’s where you can see they’re not in the Spirit. If a 10-year old is still making big messes in their pants, clearly there’s a big problem. Growth comes in appropriate stages and at the necessary times. Parents expect and plan for their babies to make messes. Believe me, I’ve seen a mess or two out of Joel I couldn’t even believe, but I was so glad I had planned ahead by putting diapers on him! How much more will God be prepared to handle the little mistakes we make. Anyways, I exhorted them to be patient, to keep breathing, eating, and drinking (spiritually speaking), and they would grow as God intends. I encouraged them to be patient with others in the church who are less spiritually developed as they grow in the Spirit as well. Who knows what exactly the future holds for Pierre? He may have difficulties and failures, but I know a God of love who used me to reach out to him, to tell him it’s ok, normal even, and that God will stick with him as he continues his walk with Him. What a timely message God gives for the broken-hearted who return to Him, just in their moment of need! I pray for Pierre, that he might grow in God’s grace and truth. Will you pray for him too? Saturday we started out at 7am and went to Broom Tusu to encourage the church. We found out that there are branch sabbath schools that the church is running and we decided to go visit them as well. This past year there have been 54 baptisms where just a year before there were no baptized members. It’s amazing to see the growth in that area! The first branch sabbath school in Broom Langa was under a large mango tree with benches under it. There were 34 kids and 27 adults attending it. It was encouraging to see so many people come to worship. David did a impromptu adult sabbath school and I did the children’s sabbath school that was also impromptu. After, we went to Broom Tusu and had a church service there. Then we wanted to go to another branch sabbath school way out in the bush. They don’t even speak the same language in that village. 16 other people crawled into the vehicle and two guys were hanging on the outside. We start going and they point to this road which really isn’t a road but a foot path and say “that’s the way!” Oh boy… We continue until we look like we hit a dead end where the path was getting smaller and smaller and the bushes were getting bigger and bigger. Oh and all the while they start singing literally at the top of their lungs. It felt like we were on a hay ride with teenagers it was so loud. I thought I was going to lose my hearing. Then one guy in the back is shouting and hitting the car and said we made a wrong turn and the guy giving us directions is shouting back to him and then the singing gets a little less obnoxious and we find our way back to a different footpath and everyone is satisfied that indeed this is the right way. Apparently we turned at the wrong bush the first time. So we go bumping along our way again and the screaming… I mean singing starts up again. It was encouraging? Yes, it was encouraging to see so much energy to go to sabbath school. The correct route isn’t much better. As we keep going the path gets smaller and we are going through grass taller than the car and fields where the sorghum is hitting the windshield. We were way out in the bush. I thought for sure I was going to see an elephant, but all the singing was sure to warn any animal in a half mile radius that we were coming. One guy was snapping his fingers directly in my right ear and the lady behind David started actually screaming that excited scream the women do. Amazingly Joel slept through the whole thing. When we finally show up to the tree where they meet at and the village chief comes and is happy to see us. There is a short sermon and more singing. By this time it is 2pm and we haven’t ate anything since 7am that morning and so we were getting a little hungry and ready to go home. We say our goodbyes and go back to Broom Tusu. Once we get there we say our goodbyes to everyone there and look for our friend we brought from Béré and send someone to get her since he knew where she went. We wait for 30 minutes and they still weren’t back so we go and look for her. Once we find them they are eating and we wait a little longer while they finish. It was fish sauce so we didn’t join in. They knew we were vegetarian so they didn’t invite us to join them anyway. We finally left Around 3:30pm and made back home by 4:30pm. Then we finally eat again around 5:30pm. It was a long day, but encouraging to see the church on fire for God in that area. Sunday we had some time at home. In the afternoon David worked on the plane getting it ready to fly on Tuesday. A few guys come by asking for loans so David loaned them some money. After, our guard also asks for a large loan. Tuesday we start the center up again and David left for N’Djamena in the morning. I strap Joel on my front and my backpack on my back and start the moto up and drive up to the hospital where we are running the center. There was a few spots that the sand was bad. Me, Joel and Zach, the community health director, and Naomi, our translator go out to several village health centers to tell them that the center has re-opened and we are now asking for a referral from the health clinics. The route to the health centers was not the best. One spot had a sand hill taller than the truck tires and so we had to turn around and go another way. On our way to another health center there was so much water we almost got stuck. We quickly reversed and then Naomi got out and walked in the road and we followed behind in the truck. One spot the water was just below or at her knees, but we made it. Then we get back to the hospital around 4:30pm and I get back on the moto with Joel and my backpack and go home. I am then an hour late for a dinner meeting I had with a friend at her house, but it’s Africa so I show up just when the food is almost done. Joel is asleep so I lay him on their mat. The mother comes over and sits with me and tells me all her problems. Her back has been hurting her for probably a year now and she still hasn’t gone to the hospital to get it checked out. There is a lump there where it hurts. She says every time she gets money it goes toward her kids’ education. She says her youngest daughter needs this much more for her school bill and her youngest son needs this much. Her oldest boy is going to university in Abeche and he has called her for three days in a row telling her he doesn’t have food to eat. She tells him to pray about it and God will provide. She said her husband is in the capital attending a funeral of a close friend of theirs. Then she said when she worked for us the other day all the money she earned went to her sister who needed to go to Moundou. So much suffering and pain. So many people needing money especially this year since the crops didn’t do well at all because the rain wasn’t enough to this year. The food was ready and I was pretty excited to wash my hands since we visited all the health centers and shook everyone’s hands and I hadn’t been able to wash my hands in a while. One guy whose hand I shook had a big sore on his mouth and his hand was kind of sticky. I try not to think about germs here. So then my friend came over with a pitcher of water and a basin to catch the water after you wash your hands and that was it… No soap. Oh boy I thought to myself. Then we dug in with our hands to eat together. Yum. After dinner we laughed a bit and I wanted to get Joel back home before it was dark and the mosquitos came out. David was stuck up in the capital over night so I spent the night alone. This was the first time I have done that when there was no one else on the compound at all. I am glad we have a guard. Wednesday came and I was happy I could spend some time cleaning my house. A different blind lady came and when I went over to her I didn’t know she was blind. Our guard just said a lady came to see me (no pun intended). I went over under the tree where she was sitting and her eyes were closed and she was sitting quietly with her hands folded. I greeted her in the local language and she was silent. I thought she was praying. There were a few kids that came with her and they just stared at me quietly. Then our guard came over and greeted her loudly and she greeted him back. She was blind and hard of hearing. She said she only had one daughter and she died. I assumed that was why she had all the kids. She said she had rice planted, but it failed this year and she just wanted some food. I had just finished cleaning out my food and had a pile of extra food to give away to someone. I was going to split it between the guards but just hadn’t got around to it yet. I was glad I hadn’t. I ran and grabbed the food. Two big sacks of beans, wheat berries, and a few other dry goods. She was so grateful for it. She could hardly balance it in her head it was so heavy. She kept saying God in the local language. I told her it was from God and not me. She was very happy. I finally had some time to make bread and sweep the house. Our washer lady came. She is a widow with four kids. When I left her youngest was 7 or 8 months old and was fat and healthy. 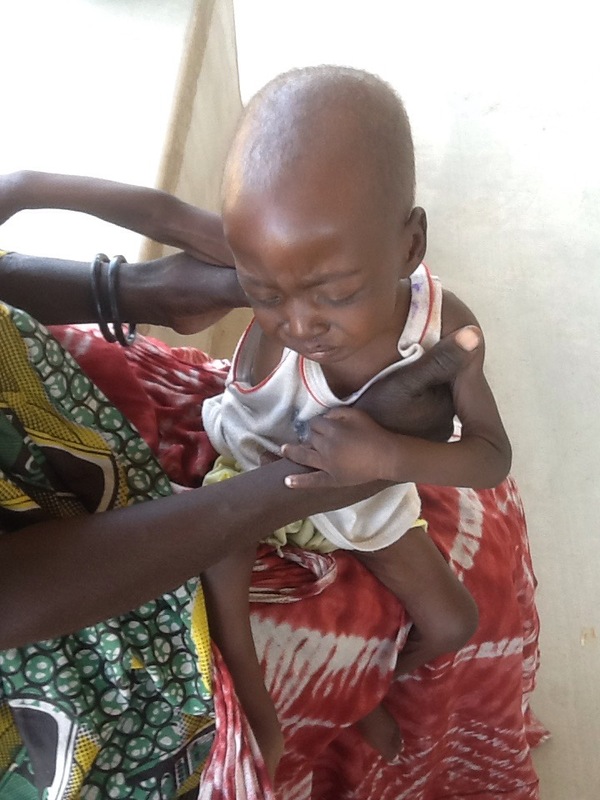 The baby is now over a year old and she has red hair, a sign of malnutrition. We increased her wages and instead of coming once a week we have her come three times a week. She and her two youngest eat lunch with our guard and other workers on the days she works. I also give her any fresh fruits or vegetables I have extra so the kids get more nutrition. I gave her a pumpkin this time and she was really happy. David flew home and brought some cheese he got from the capital. A real treat! We enjoyed some sandwiches together. Then today was Thursday and David flew early this morning. He went to see a guy who is trying to run an Adventist primary school in his village, but has no money. It’s a complicated situation that is hard to know what to do and how much to give. Another day at the center. So I strapped Joel on my front and put my backpack on my back again (I packed it a little lighter this time) and I drove the moto up to the hospital again. I was so tired since Joel got up a lot during the night and it is getting colder at nights so I get up and put blankets and clothes on him as the temperature keeps dropping during the night. It starts out in the mid 80’s and drops down to low 70’s by morning. Once we were at the center Joel just wasn’t able to take a nap at all so it was hard to work and keep an eye on him. I got back on the moto and drove back home. Three more people came to tell me there sad stories and get some food. Joel started crying and crying so I went to take care of him and told our guard I would be back. I got Joel down for a nap and I was so exhausted that I laid down for a moment and fell asleep and woke up an hour later. David arrived soon after. I had a very distinct learning experience yesterday that I’d like to share. Maybe it will encourage you as well. I was working on the airplane; there were a number of little things that were adding up, and with a slightly unusual buffering I felt, I decided I just needed to stop flying until I could take a look at it. So yesterday I finally had the chance to spend some time on it. I fixed a small leak from an oil line, lubricated a sticky throttle control, unsqueaked a squeaky aileron, changed the air filter, checked tire pressures, and took it up for a spin to see what was going on with it, and everything looked good. As I worked, I was listening to some talks from Otto Koning, a Dutch Reformed missionary who worked in West Papua in the 1960s. He was telling some stories about rejoicing in hard times in the mission field. Finally finished, I gave a call to a friend who was waiting for the plane to be ready to go to N’Djamena for some dental work, and we arranged to leave early the next morning. To get ready to leave, though, I had to fill the fuel tanks… Normally, it’s not that big of a deal. I have one of our workers pump fuel from a drum while I filter it into the airplane. Recently, however, I broke the casing around our fuel filter on the pump. So now I have to use a siphon hose to slowly fill 2 5-gallon jugs through one filter, then lug them up to the top of the wing where I pour it into another filter that doubles as a funnel. Again, it’s not a big deal, I only had 25 gallons to add. As the fuel drum got emptier, though, it became more and more difficult to get the fuel out, so what do you do when things aren’t going right in Africa? You improvise! I propped the drum up on its side on a bench to get some help from Mr. Gravity, then had to prop one side up more so the fuel came closer to where I was at. I was getting stressed and frustrated with it all. Just like that, the negative feelings and frustration went away, and I was able to patiently finish the job. It was incredible. How often do I rejoice when bad things happen? I know I don’t much at all. But what blessings God has in store for us if we just take Him at His word, and follow what it says!